Rediff.com » Movies » Shah Rukh Khan's first video blog and more! Shah Rukh Khan's first video blog and more! As promised to his fans, Shah Rukh Khan shot his first video blog in which he talks about his IPL team Kolkata Knight Riders and daughter's birthday. He also promoted his upcoming film Ra.One in one and a half minute video clip. In the video, he promised to release the Ra.One trailer by the end of this month or in the first week of July. He also rated various events of his life in scale of one to 10. Talking about rating, how would rate SRK's first video blog on the scale of one to 10? Shah Rukh Khan wasn't the only one getting candid on camera. Abhay Deol also shot this video for fans. He shared this video where he answered questions that his fans asked him on twitter. Arbaaz Khan: Malaika and I are very much together! Arbaaz Khan is apparently not happy with the rumours of Malaika Arora Khan and his separation. It was speculated that Salman Khan doesn't approve of Malaika's lifestyle and they don't invite each other a lot. However, Arbaaz rubbishes the story. What can we say except that there's no fire without smoke! 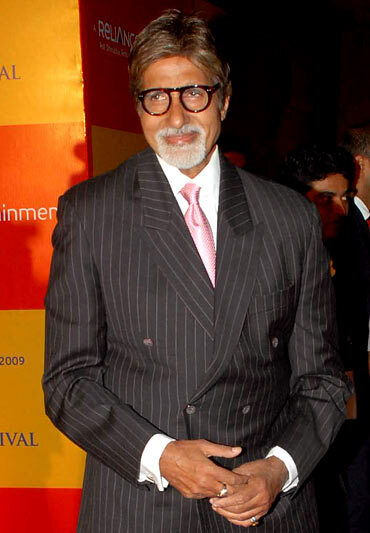 Amitabh Bachchan sounded very proud as he revealed the budget of his film Bbuddah - Hoga tera Baap. 'The sensible outlook in making of films today .. controlled budgets !! ..'Bbuddah -Hoga tera Baap' complete in 10.5 cr . BHTB film in profit before release due to cost control .. Satellite sold for 13.5 cr .. cost covered before release !! Well done Puri,' he tweeted. Meanwhile, we also hear that daughter-in-law Aishwarya and is planning to get into production. The actress has reportedly slashed her fees and so has her co-actor Arjun Rampal for Madhur Bhandarkar's Heroine and has demanded a share in the profit of the film. Sonakshi Sinha was up early and perhaps on time for her 9 am meeting with a smiling face. 'Hi all u sleeping people. Still shooting. 9 am meeting. Still smiling!' she tweeted a picture. Raveena Tandon, on the other hand, celebrated Karan Johar's b'day at Shah Rukh Khan's place where they watched Kolkata Knight Riders' cricket match. 'Happy Happy Birthday KJ! KKR!! MI !! Torn again!!' she wrote.